It was disgustingly humid today, and the girls were not happy to have their hive inspected. I didn’t like wearing a bee suit in 70% humidity so I guess we are even. I got stung once on the hand (or rather on my glove) which kicked off more aggressive behavior because bees release an alarm pheromone when they sting. 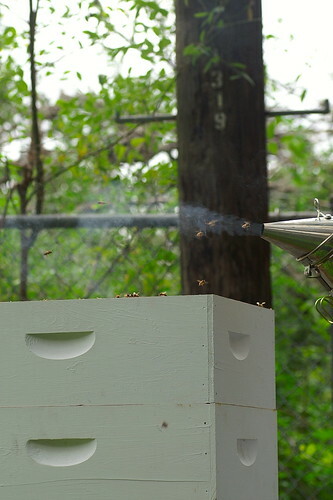 The smoker was put to good use today to calm the bees down and mask the pheromones. With the exception of a bunch of grumpy humid bees, the story is very similar to last week. Supers 4 and 5 are still mostly all honey. Supers 1 and 2 are mainly brood, and the girls just really aren’t drawing out comb in the 3rd position super I added to give them more space to try and avoid overcrowding and a swarm. 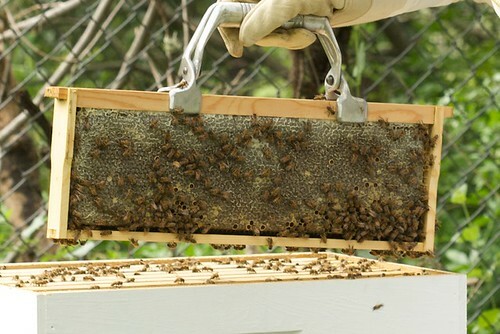 Bees need a good flow of food coming in to draw out wax so I may need to feed them for a week to help them get that 3rd super filled up with comb. July usually is a hot dry month for Austin, but it has been anything but with the storms in the Gulf, and there seem to be a lot of flowering plants around the hive. Even so, I guess it is not enough even with the 2 full supers of honey. I did move some drawn out frames of brood into the 3rd super which will hopefully encourage them to use that space more and the empty frames in the 2nd super will also give them more room. I still haven’t seen Large Marge, but there was plenty of eggs and larvae which means she is in there somewhere. I’m also seeing good brood patterns which means she is laying well. There are also some very nice frames of capped honey in the 4th super, but I’m going to leave it in there for now. July and August will be lean months in terms of nectar and pollen availability. 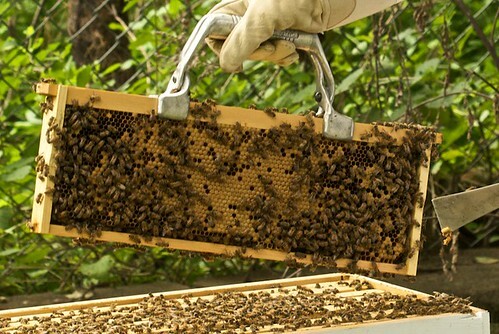 I now see the plus side of having a mechanical extractor because you don’t have to destroy the comb to get the honey. I really don’t want to remove any more honey and give them back more empty frames to draw out again since they are having a hard time with the ones in there now.